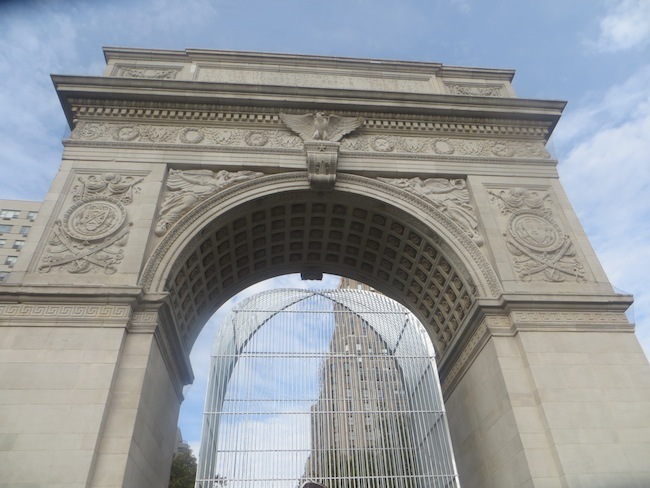 On Saturday afternoon, October 7th, for a couple of hours, the controversial Ai Weiwei exhibit at Washington Square Park, “Good Fences Make Good Neighbors,” installed under the Arch recently yet gated off, an art project that has already stirred up controversy and some anger amidst park users, proving not to be the best neighbor, opened up its gates so the Public Art Fund could get official photos for their promotional efforts of people walking through. WSP Blog was there. 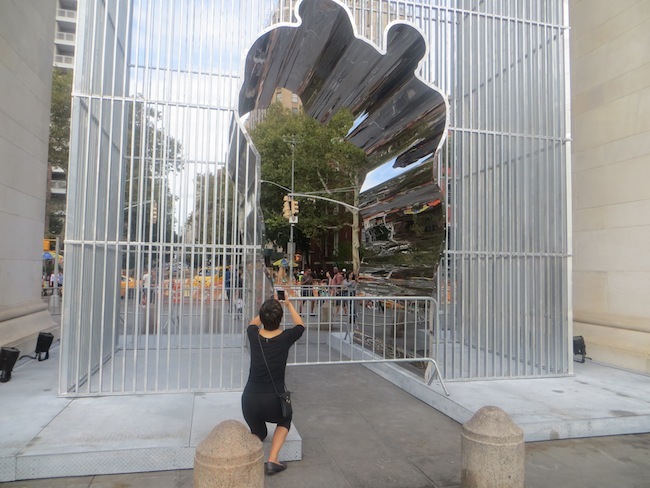 A Public Art Fund employee told me that any controversy that ensued was about “one or two neighbors,” basically all from the Washington Square Association in this person’s view, which sounded like it was also the Public Art Fund official line. 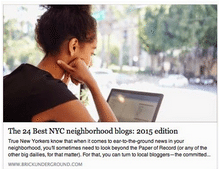 People following this blog, which first broke the story, and other media, know that that is not the case. 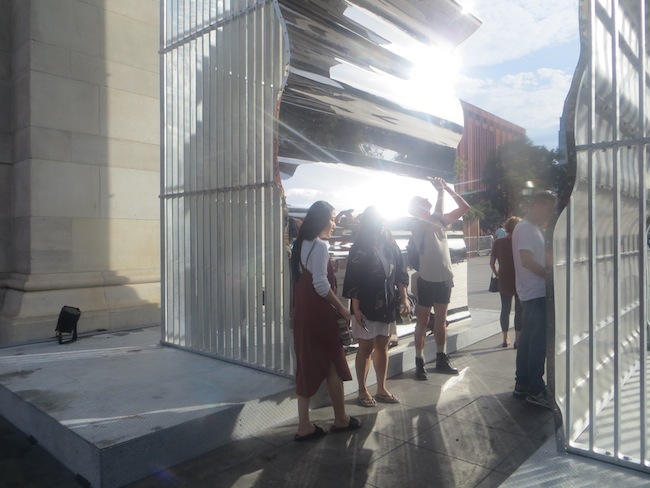 Significant issues around lack of public engagement and the fact that the private Public Art Fund waited to announce the Arch as one of the 300 city wide locations at the last minute. The organization, just a few months prior, invited a few community groups to inform them that this was coming (including Community Board 2 chairs) but insisted they keep meetings confidential (note: they did not have to agree). One of the major issues is whether the Arch, a destination itself, a landmark, a historic monument, should be engulfed by other art, when already it is art. 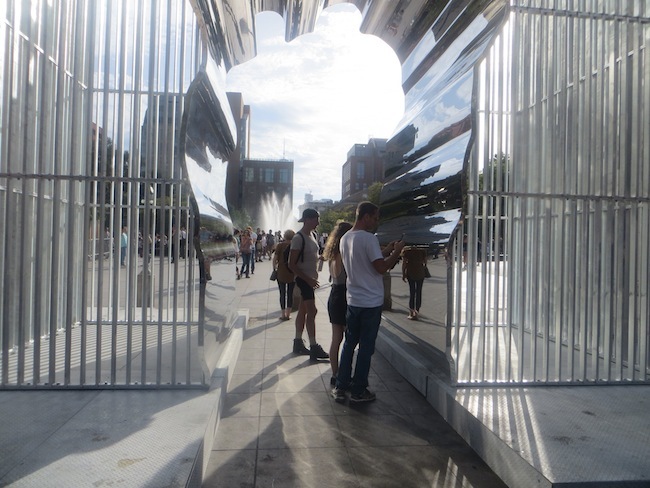 Of course, when opened up on Saturday, people wanted to go through, as they walk under the Arch too, but what stood out to me is that you don’t feel as if you are in cage or bound by a fence when you walk through, it is more like, ‘oh shiny walls.’ You cannot see the cage when you are walking through. 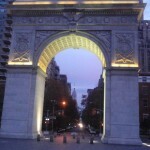 At the Community Board 2 meeting in early September, Trevor Sumner of the Washington Square Association said that the Public Art Fund would be using the Arch as the main attraction of the entire city wide project, and the fact that today there is a “Public Preview” of “Good Fences” AT Washington Square Park does confirm this. 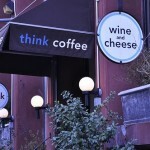 Perhaps they might have considered another location, in light of the controversy and tensions. 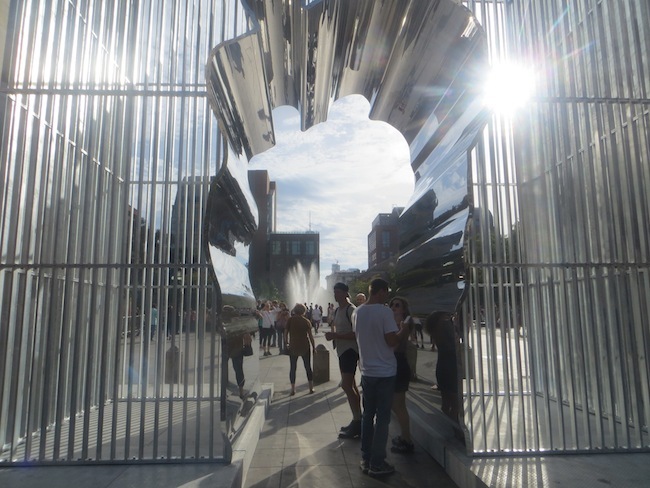 But the Arch is the Arch, and you will see why they wanted this location so much once this opens. 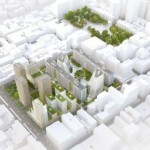 The Parks Department, particularly Manhattan Parks Commissioner Bill Castro, knew that many neighbors, park users and protectors would not like this idea, so he, in all likelihood, coached them to do this in this non transparent way, also knowing that the Community Board would be fairly compliant. (More on that to come.) 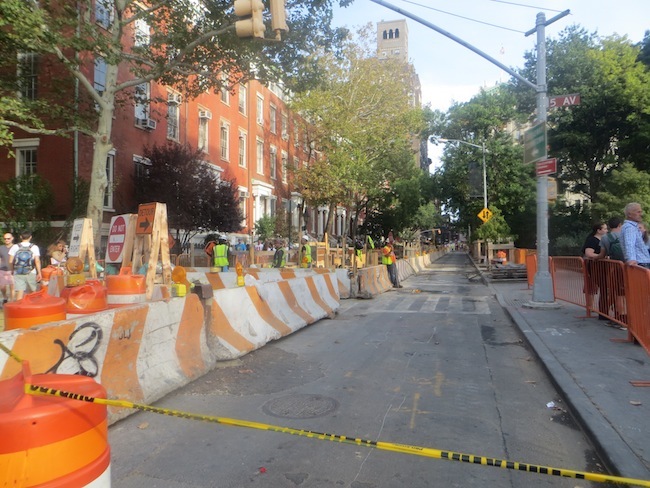 At the Community Board meeting on September 6th, Commissioner Castro attended, but, notably, did not speak or make any public comment about the project. The full Community Board 2 voted 26 in favor, 8 against, on the Parks Committee/Arts & Institutions resolution which tries to make this a one time thing, critiques the process, and, in my opinion, leaves out of the Resolution the most important part – that the Arch is a destination and a landmark onto itself; that was the main point that people wanted registered as to why the exhibit should not happen, as well as not wanting the park/public space to become used for art projects repeatedly ever after, thereby setting a precedent. The exhibit is scheduled to remain under the Arch from October 12, 2017 through February 11, 2018. More to come at this blog on the “process” that led to all this. 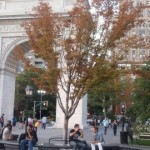 4. requests that Public Art Fund continue to work with the Washington Square Association to find an alternative location for placement of the Holiday Tree and that it cover any incremental costs for placement in this alternative nearby agreed-upon location. Good coverage and explanation of issues, and excellent photos! Hideous, stupid, condescending, overbearing, patronizing and useless Corporate Art. What a waste of money. I see this artwork as political commentary about a proposed wall on our southern border and our current immigration policies in general. I also see a reference to an artist and artwork from the ‘30’s. How is this artwork “corporate” other than the fact that you don’t like it? This artwork kept me from meeting under the arches! That location has served for 27 years as the starting point of the dachshund meetup hosted by the Dachshund friendship club. Why can’t the public, use the park as public space to play? We were pushed out by people who are more entitled. I don’t like the art. I don’t think it is fair to have it there. Really, Ms. Kozoil – You, your group, and the dachshunds have all been “pushed out”? You will not be able to find each other in any place except immediately under the arch itself? Are you serious? Or are you, as you denounce other people, just “more entitled”? 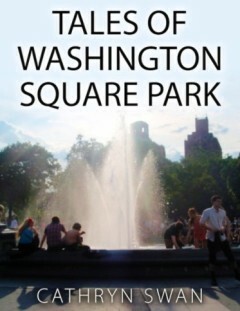 After 27 years, perhaps it is “fair” for you to share this public space. 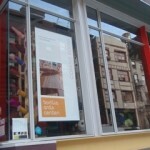 Sorry but whole process and lack of transparency really soured me on the installation. Maybe I could’ve enjoyed it more if I didn’t feel like the the cultural elite shoved this bougy art in my face. I agree with comment from Stacy and also Patti and Karen. 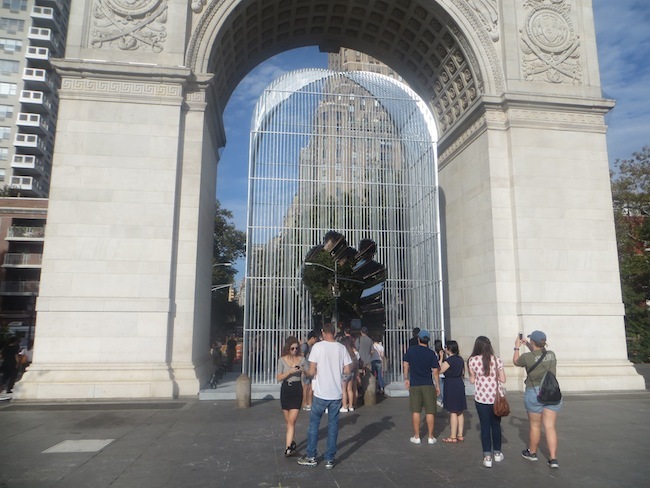 I dont think this project should have been under the Arch, and when they, the private Public Art Fund representing Ai Weiwei, finally came before the public, they were very smarmy about it, and it was clear that it was strategic to keep it from the community at large. This *art* does not belong under the Arch, and, if there is any semblance of *good neighbors* around this, then they might have come to the community sooner, and moved the project elsewhere, either within or nearby the park. 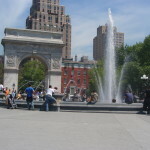 They did not because the Arch IS the Arch, as I wrote, and that affords them publicity (like how NYU uses the Arch) that they knew would go far. But that does not mean it is the right thing to do. 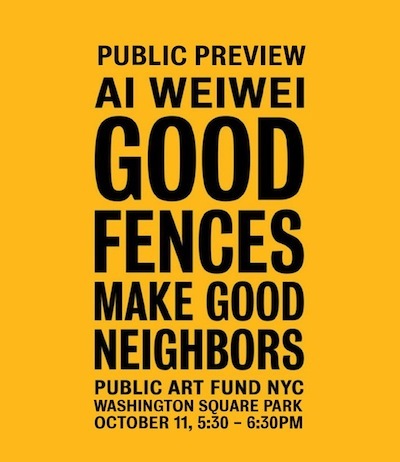 Alright the Ai WeiWei “Good Fences” has arrived despite the best efforts of the smaller grass roots Washington Square Park residents associations. I feel very sad but since we had less than 60 days notice to combat a process that had been underway for over a year “they told us we had to keep it confidential” (who is “we” and who are “they”? hmmmm) I think we put up a pretty good fight. Artistically, I have to say the artwork itself immediately brought to mind pictures of those utopian European Public Toilets. From reports of actual viewers it’s not “Fence-like” at all, more “oooh groovy cut-out with shiny walls”. There is nothing confrontational about this piece at all except to the rights of the real neighbors the “little people” who actually use the Park as a public space. 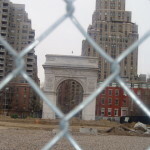 As I have said all along Ai should have put his fence along the south side of the park to block NYU’s systematic destruction of the entire West Village bet then you would have seen some sparks fly! In my albeit “outsider” experience (FUN Gallery – Haring, Basquiat, Fab 5 Freddy, Scharf) in the commercial art world I have seen the Julian Schnabelization of an artist to the corporate model and I am very sorry to say I see it here. 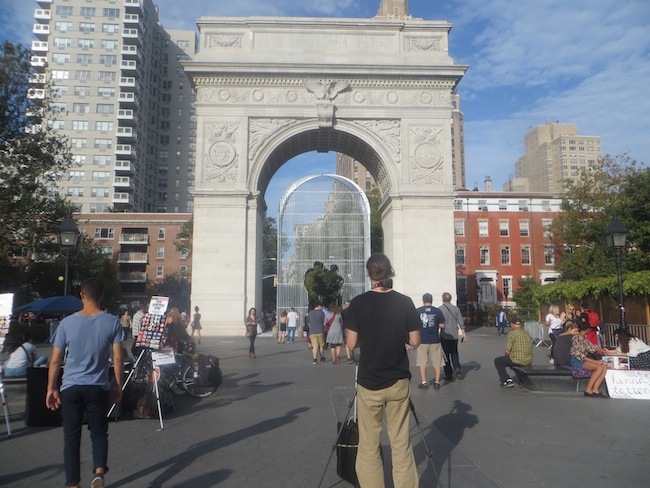 The Washington Square Park Arch is a work of art in itself and to desecrate this gorgeous monument with ANYTHING I see as on a par with Tony Shafrazi’s graffiti attack on Picasso’s “Guernica”. Just because he became a financially successful art dealer doesn’t make it right. Where was your helping hand last year when we fought to save the Hot Dog vendors many of whom were legal immigrants and were faced with losing their part of the American Dream? As far as I know they have not been able to return. The Christmas Tree Lighting and Community Tree has been a tradition since 1924. What about the families who plan that as their special celebration as they don’t have the finances or room for a nice big tree? I’m sure they start planning for getting there early for a good spot, the snacks they always bring, their holiday outfits and the yearly family photo. Acquiring the location seemed far more important than the effectiveness of the art on the issues. It has to be in an internationally recognized location with links to the artists’ personal history and to the traditions of the Village. It can’t even be to one side, it has to be in the absolute center of focus. But abstract, clean safe and beautiful. A work of art before a work of protest. And in the process, a great big long duration footprint is established in another public space, so wealthy-donor private organizations now have a precedent of public-private partnership to use WSP as donors deem appropriate. CB 2 saying “one time only”? That certainly will be ignored the next time around, and when branded activities start “serving the public” in the park for months, and on and on. After all, the art work will be declared a “success” unless it falls on someone, and only “one or two” persons had any concerns. 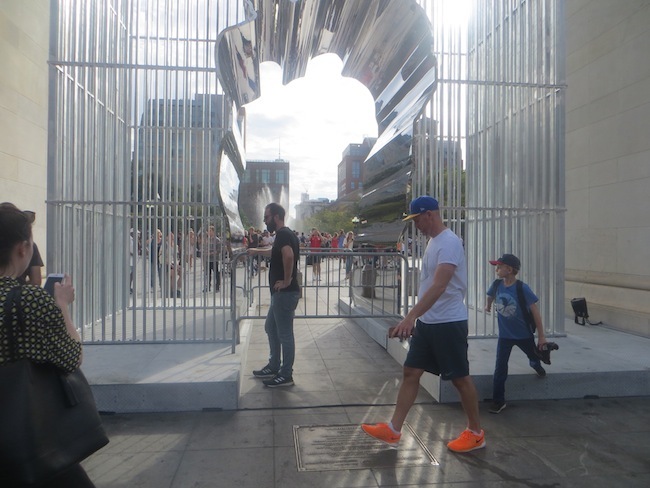 Public Arts Fund: “we can’t release any details about a project that has not yet been finalized” – late summer. Yet project in the works for over a year. WSP Conservancy: “There is no information about the WSP Conservancy specifics because it is still in formation” — at meeting of CB2 vote on official approval of the Conservancy. Yet fully defined in writing in already submitted State and IRS filings written by an attorney of the Parks Department, and the Conservancy having already held a minuted official meeting. The parallels are obvious. 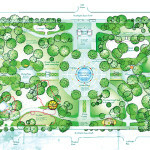 Public-private cooperation between Parks and donor-driven secret private organizations seeking control over public space is being used to supplant public governance of the spaces. In both cases, the need is for the interaction of Parks with these private organizations to be treated as public, in realtime, all the time. Strongly agree just heartsick over the way this has gone down. All we can do is heighten our vigilance in the future and press for full disclosure. If they had had an open comment period I would have suggested that the artist ask for Thomas Paine park, right next to the DHS and various courts personnel. Make an installation targeted to their role, that is in their faces for four months. This would have gotten more press and attention worldwide by far. And if he had asked for this, and Parks or the Fund had fought it, I expect I would have pushed back on that. But the process was not public, so no such support was possible. 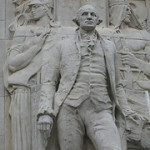 I don’t intend to diminish the issues or the artists’ knowledge of them which clearly is vast. 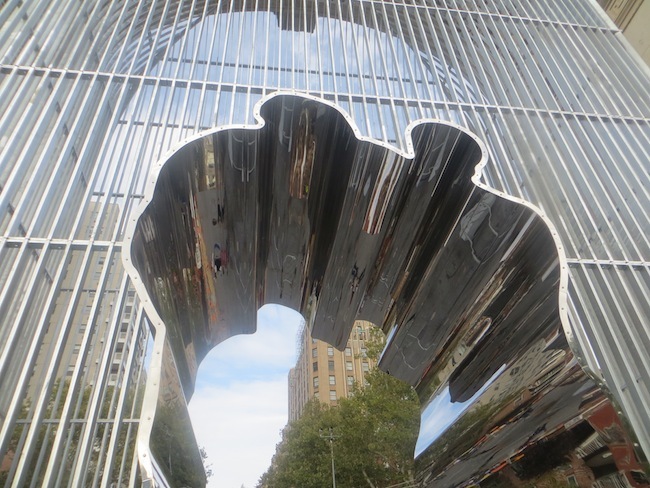 But as an effective communication of the gravity of the issues to a passerby, I wonder if “Arch” lost some edge due to donor billionaires rounding the spiky bits off it, like confrontational message and locations. I just wonder. I really do wish the best for the artist and his continuing endeavors. Unfortunately if you read the artist’s Twitter comments about how he made it so it would “be great for selfies!” you would feel as sick as I do. I have been in Los Angeles for many years working in small restaurants when the shout goes out in la cuchina “La Migra!” or you are down at the border and see families making a run for it dragging exhausted flagging members along they don’t have out their cellphones. Just furious about this whole thing. Oh? Then I can only imagine given what he has been through and the vast number of activities he has taken on about human rights issues, that he may feel at least some of his works have to tap into the oceanic flows of superficial likes and shares and +1’s that constitute a lot of how people find out about things these days. Among those folks a few will be motivated/inspired, but still perhaps a large absolute number. Also, it may give him press and historical prestige that would advance more pointed work and personal statements about issues. If you make a very earnest exhibit that’s only seen by 10,000 and barely covered in the press, you have to be sure that 10,000 are important people to the issue if you want it to count in the short term. The big disconnect to me is the way the Fund and Parks used protracted secrecy and deliberate misdirection to defeat a meaningful public review process. It is easy to attribute manipulative motivation to that. They might say they were 100% at the service of the artist, but their actions speak of additional agendas regardless what the artist sought. The silvered Kryptonian x-ray hole bored through “Arch” doesn’t by default communicate the scene you describe. 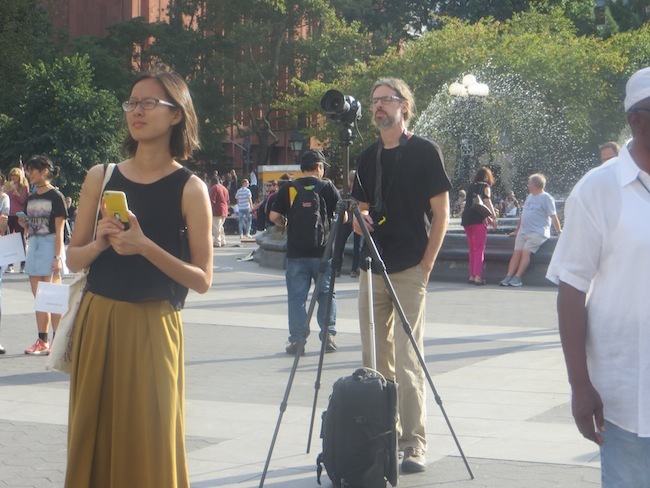 Perhaps protesters will establish positions nearby and hand out information that contextualizes the work. The Park is good for that sort of thing. If the arts organizations don’t argue against reinterpretation, and the Conservancy doesn’t complain about tables “blocking the Arch view”. That is a great and positive suggestion after all we’re stuck with the thing for 4 months might as well make the best of it! I would imagine that immigration interest groups seeking DACA support etc. have already thought a lot about what they may be able to do with the show. If DACA reaches a critical moment, perhaps there will more likely be a march to WSP or Central Park because the works are there. After all, such a measure could be an example of reasoned balancing of concerns which the project title seems to demand. 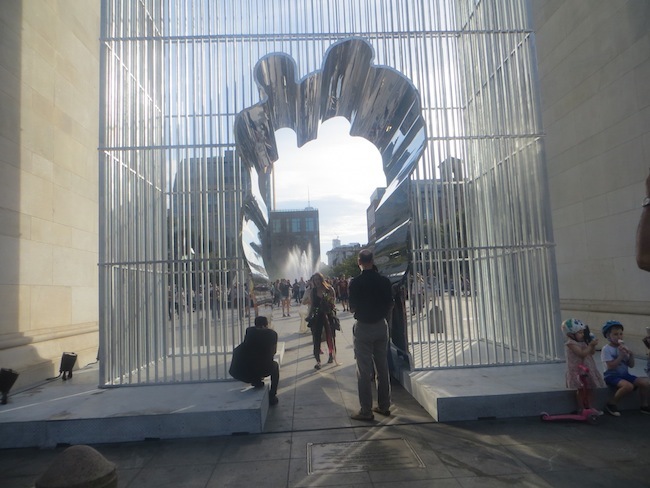 The artist’s intentions and statement are clearly over-shadowed by his self-indulgent disrespect for the previous artwork that occupies that space and the artisans who created the marvelous arch. The space under the arch is as much a part of the arch as the stone. They are inseparable. The stone frames a view to the space below and beyond. The stone defines a space that beckons one to pass under, and as one does, the stone bestows an ambiance upon the portal below. The space belongs to the arch; or rather, it did. Placing another artwork under the arch (irrespective of its stylistic incompatibility) is no less distructive than painting a new image over another artist’s masterpiece. How is it that no one protected this marvelous creation and defended the long silent artisans? Very well put Earl. We tried but as usual the corporate art establishment prevailed. Lessons were learned for the future.